Overview of the major manufacturers of sleeping bags. Anyone who intends to hike, knows exactly what to take with them, to feel comfortable and safe. And one of the most important things you should definitely put in the way, is a sleeping bag. No matter how long you may warm things they took with them, in whatever weather or going to go (even if it's the heat of summer), a sleeping bag you will definitely come in handy. He's not just warm, but also perfectly balances the heat of our body. So, on a cold night in a sleeping bag, you will feel quite comfortable due to the fact it maintains optimum temperature for humans. The most popular models are considered sleeping GreenWood FS 1008 and Alexika Mountain Compact. But we are all different, you say - someone who likes to sleep when it is cool, while others feel only comfortable warm. And you'd be right. Therefore, sleeping bag worth chosen strictly individually, taking into account all the features of the human body, which will use it. Of course, sleeping is not sewn under each individually, and there is some universal things, which would be warm in the winter expedition in the mountains, and in the summer in the woods. Yet there are several temperature regimes sleeping. Talk about them. As a rule, sleeping bags have two thermal regime. This comfort temperature and the temperature extremes. First the temperature at which the person will feel comfortable in this bag while in a tent, and the second - the maximum permissible if it is to sleep in the open air. To be sure, most likely at the extreme man can not be too comfortable, but the maximum temperature when a person is protected from hypothermia. There is a European standard temperature sleeping bags, which was adopted about 10 years ago and which acts everywhere. He is referred to as EN13537. It is from this ideal value calculated thermal regime to make you warm and comfortable in any weather. Among the popular all-weather sleeping bags - Deuter Orbit 0, Marmot Trestles 30 Reg, The North Face Cat's Meow Reg. Very importantly, what internal and external coating has a sleeping bag, and what it is used for filler insulation. Of course, the ideal would be to hike sleeping bag filled with fluff. It is the easiest of all. But certainly the most expensive. In fairness, it should be noted that thermal insulation properties of feathers in a sleeping almost equal sintepon and hollofayber. They, of course, difficult to "compete" with a natural filler, but also in sleeping bags if you do not want to overpay for fluff, you will be quite comfortable. But it is important to know: sintepon hollofayber and not last as long as a feather. They eventually "caked", thereby losing its insulating characteristics and in a few years is no longer suitable for use. By the way, a great alternative to sleeping bags of down sleeping bags are made of silicone fibers inside which contains air. This bag is very convenient to use. He is not only durable, but also elastic. It is conveniently located, and even after several seasons of heavy use it is as good as new, retaining all their original properties. And a few more tips. 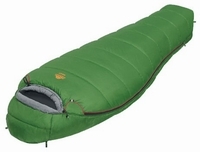 Usually sleeping bag has a standard length - 235 cm Usually, this is the perfect size for most. If you have to rise above 2 meters, it is recommended to order custom tailoring sleeping, or it could be just a "press." Generally, it is desirable in the store to "try on" a product of his buttoned zipper and secure it. The bag must be large enough to it was possible to turn and bend the legs and arms. For a child it is advisable to purchase a special children's sleeping bag. If the campaign - it's your honeymoon, or you just do not want to part with a loved one, even during this time, you can purchase a comfortable double sleeping (Sparky), and then you will be doubly warm, cozy and comfortable.